This aircraft is a peek at the future of unmanned aerial vehicles. Autonomous, stealthy, versatile. 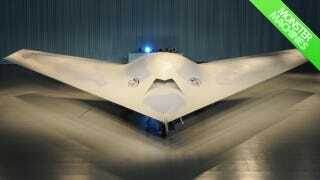 The Phantom Ray made its 17-minute official maiden flight last week. It only zipped by at 204 mph at 7,500 feet—but the 36,500-pound drone is theoretically capable of reaching a cruising speed of 614 mph (0.8 Mach) with a combat radius of 1,200 nautical miles. It's also meant to fly at 40,000 feet. Developed as a test platform for advanced and future unmanned aerial tech, the Phantom Ray is a stealth drone that'll be able to fly and perform missions basically autonomously—no one has to sit at the controls while it's up there, doing its deadly thing. Right now, it's designed to be capable of basically any kind of mission—from intelligence gathering/surveillance to suppression of enemy air defenses and electronic attack. There are a couple options for direct assault: Either two Joint Direct Attach Munitions or eight Small Diameter Bombs. Part of what makes it radical is that it comes from Boeing's Phantom Works, which rapidly prototypes and gets these things off the ground as fast as possible, even if when they're not completely finished.